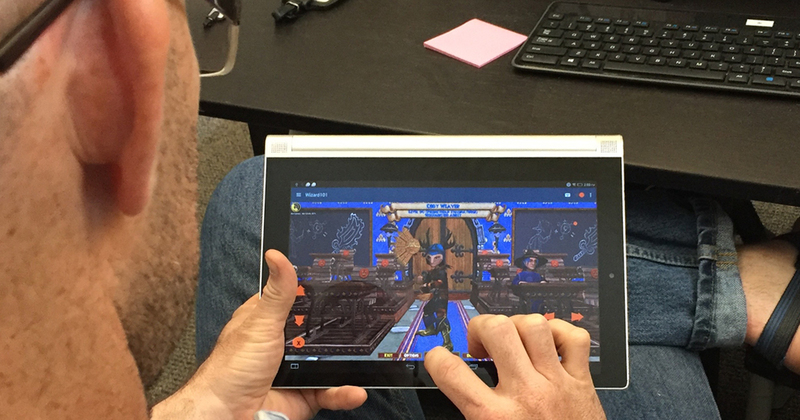 A year ago, we gave you a sneak peak at our CrossOver Android development. At GDC in March, we showed up with CrossOver Android supporting LIMBO and the Steam Client. And with Google’s announcement last week that Chromebooks will soon be supporting Android apps, we wanted to share that its very likely you will soon be able to run Windows applications on Chrome OS with CrossOver Android! Bear in mind that CrossOver Android is still very much a work in progress. We’ve spent the better part of the past two years building the framework for supporting Windows applications on Android, and it's far from finished. But to that point, we’d like to bribe you into telling us what you think should we should focus on for CrossOver Android development. For those big picture people, what Windows applications and games would you want to run in Android. Potentially. We also want to know your true wants and needs for a CrossOver Android product. What could our CrossOver Android product deliver to solve your problems? CrossOver Android is the perfect product to ___________________, ___________________ AND ___________________. You comment, and we will buy your candid opinions, thoughts and foresights with one free month of CrossOver (either added to your subscription or with a brand new subscription). Please note that our System Admin will be reviewing your comments for eligibility and it may take up to 30 days to credit your account. All comments must be submitted by no later than June 19, 2016. Answers such as the following will be marked ineligible for our bribe. CrossOver Android is the perfect product for tax evasion, rigging the next presidential election AND spaying & neutering your pets. CrossOver Android is the perfect product to inspire dread, spread pestilence AND damn your soul. May the odds forever be in your favor! We can’t wait to hear from you. Google: This is Android Narshmallow. It has multitasking improvements, a better notifications view, and we fixed Stagefright once and for all. Me: Yeah, but can it run Crysis? To be honest (and I'm not trying to be a troll here - I'm a big fan of Crossover), I don't personally have any use for CX on Android. I have an Android phone, 8" Android tablet, Linux desktop (where I currently use CX), and a Windows laptop. It seems to me that as a rule, developers tend to provide decent apps to substitute for mainstream desktop software that people might want to use on their mobile devices (e.g. MS Office, Quicken, etc.). And in my experience with a touchscreen windows laptop, if a piece of software wasn't designed for use with a touch interface, it's miserable to try and use it with one. Even if we're talking about large screen android devices with keyboards and touchpads, I don't feel there's much functionality "missing" from the current crop of Android apps. In other words, can't think of any desktop Windows software that I wish I could run on my Android. It's really cool from a technical standpoint that this is even remotely possible, but to me it's not going to be very useful. On the other hand, there is still LOTS of software that desperately want to run on my Linux box but can't. MS Office 2013 is the main one of course, along with Evernote desktop and DX11 games. For me, after reading this post, I just found myself wishing that whatever resources are being devoted to CX on Android could be diverted to getting these things working sooner. Windows software on Linux is the reason I pay for Crossover. The one possible thing I might use CX Android for would be the software behind USB syncing dongles for fitness trackers. I have a Garmin device and my wife has a FitBit, both of which have USB dongles for pairing with a PC to sync data. Obviously I can plug the dongles into any of my devices, but the software won't work on anything other than a Windows PC. It would be great to be able to use these apps on my tablet, my wife's Chromebook, or on Linux, but I know there are challenges with USB drivers and such. Thanks for all the hard work on CX! It's an indispensable part of my workflow; I just hope Android doesn't become a distraction from the things that make it so useful. If it's possible to get fast graphics working well on Chromebooks, I would recommend at least having a game which is free (as in beer) smallish (not 100s of MBs, won't fit on a Chromebook otherwise) and with multiplayer among the first batch of tested applications. So basically a small fun multiplayer game. That could work well to encourage people to try it out together. It may be hard to find something like that which is more unique than what will be available with all the games in the Play Store though, but those may not suit so well to Chromebooks when they rely on a touch screen. I have used neither Android nor ChromeOS yet myself, so maybe I'm off here. Key will be finding something popular which is clearly missing in the Play Store now I suppose. Maybe there's a market for educational software which is missing ChromeOS/Android ports, but which schools still wish to use even though they switched to Chromebooks. It will probably be hard to get USB devices to work, but this indeed seems like a strong use case. Also navigators made by TomTom rely on Windows software for their map updates. I have to update my aunt's because she only has an iPad to use. I suspect there will be many more people stuck in such a situation with just a tablet (or Chromebook) available as a main computer. This is a tough one, as I never thought "I was just love to have Crossover on Android". Personnaly, I can't stand tablets. They're small touch screens of limited power and often a damning interface that makes me swear a lot more than I should. Windows software on that interface just appears to be a nightmare as none of them were built with tablets in mind. I really don't see myself using CX on a tablet under any circumstance. Taking for granted that the interface issues would be solved, I think you should go for enterprise needs. Businesses have inventory software, billing software, different kind of logistic software, and I'm sure that a lot of it is legacy. Running such software on tablets might be much interesting for businesses than running a game, or other silly software for the general public. If there's a use case for Crossover on Android, it lies with businesses and their internal, possibly purpose built software. It probably a dream of some manager somewhere to run the damn company software on something more mobile than a general use laptop. And let's face i t, businesses have money, and subscriptions for support wouldn't be much of an issue. When I heard about this, I was extremely excited. I love PC gaming, however the time I actually have in front of my computer is quite small, and I spend a lot of time on my mobile android device. With CrossOver for android I think it could bring some competition to Microsoft's Surface line for android systems. Inevitably most comments here wil be by techies who have actually heard of CodeWeavers and so will have a degree of knowledge that the ordinary tablet owner do not have. 90% of us who use computers at work will be using some version of Windows. Therefore, I think the first task is to ensure that MS Office will be seamless on Android. It is true that there are a number of great substitutes to Office available on the Play Store but my experience is that the majority of people like the familiarity of programs that they are already use at work. Thereafter, I would suggest that the next priority would be to provide an architecture that allows you to run those expensive programs that you shelled out your hard earned pounds or dollars. I am thinking specifically of the full version of Photoshop and Rosetta Stone. This will give people a financial incentive to pay CodeWeavers a subscription rather than pay various program makers an additional licence fee for a product that you already own. I am hard pressed to think of any other program on my laptop that doesn't have an excellent Android alternative. There are two programs that I would like to run. I want to be able to play games that require OpenGL support (if Android doesn't have it already.) Rhytm games, specifically. Like Stepmania, OpenITG, and Audiosurf, to name a few. I'd also like to play full versions of games I bought on Steam that I can't play on mobile without some incomplete port stopping you from getting the full experience. I'm a bible student and this particular application is absolutely phenomenal for doing theocratic research and also for preparing public speaking parts I periodically deliver. This has been a consistently popular application to use Crossover for on Mac/OSX systems for nearly 15 years (https://www.codeweavers.com/compatibility/search?name=watchtower). More and more of my fellow bible students are using android tablets these days, and while there is an online version of this library/database it's not as extensive, or as feature rich as the desktop version. While there are of course a number of free J-E-J dictionary apps available for Android, this one is simple, effective, and has stood the test of time (popular sine the late 90's if I'm not mistaken). It has excellent kanji lookup tools and back in the day there was a Pocket PC / WinCE port available, which was just about the best you could get in the way of a portable dictionary, short of spending $200+ on a stand alone device. I still use it extensively on the desktop, and would love to have a portable version of it again. These days I''m doing a fair amount of scripting/coding for work as well as play. Sublime Text 2 is my preferred editor (and is pretty popular in general). Due to the nature of the specific projects I'm currently working on I'm doing a modest amount of both shell and python scripting on Android devices. Environment/experience parity with my desktop based activities would definitely speed up my productivity. Anyway, that's my prospective usage in a nutshell. I'm sure I'd find a bunch of other things to do with Crossover on Android of course. Super looking forward to seeing what you guys come up with! I care about Crysis and heavy gaming too and i know it was ported to Nvidia shield, but for this we need also some beefier android HW, but hardware wouldnt be there before those demanding apps. Its not big deal when Minesweeper is running. - most of the Windows Software (USB and Bluetooth) ODB - ODBII Protocols for adaptors like ELM327 for all Car-ECU's would work. CrossOver Android is the perfect product to play PC games on Android OS for PC, as Chromium or Remix OS and bring your hardware to the maximum power totaly free. Perfect for use in pinball or arcade cabinets. CrossOver Android is the perfect product to run bandwidth management software, like P2POver to monitor & control my network bandwidth through wifi and make sure every client get equal and fair bandwith. For that function i wanna pay for one time payment which not more than 10 dollar. as I have been waiting already a long time for CrossOver Android, I was very happy to read your mail reporting progress on this matter. Especially for the purpose of using CrossOver Android I bought a tablet with Intel x86 chipset last year. I would like to use CrossOver Android for one single - but for me very important - programm: Watchtower Library. I use the German version as well as the English or Spanish. But as in this programm just the the language content differs between the versions, I hope that there will be no problem to use another language version than English. I also would like to mention that there is a new edition every year. But as you already listed this program in the section "What Runs" (https://www.codeweavers.com/compatibility/crossover/watchtower-library-2015) I am in very hopeful expectation of your further developement. Maybe porting a programm which already runs with Mac and Linux will be easier for you. So I am eagerly waiting for your final product. But even if you would be able to deploy an alpha- or a beta-version I would appreciate to use and test it - even if there may be some bugs in the code. Please inform your customers soon, if there are any new developements. I have a Zenfone 2. Great phone, Intel chip set. I play multiple older games in my spare time because most 3d games make me motion sick. You see, I have a Chromebook that I had used since 2013. Because of its limitations, I cant run the necessary programs I need for my classes. Without Windows, I can't do CHIDE coding, which is a necessity to my education. But discovering this project, I was excited to see what it will become in the near future. I would use CrossOver endlessly, with its capability of running Windows applications in a Chrome OS platform. It seems like an awesome idea! As for feedback, I would recommend having a way to use my Chromebook's SSD in order to save Windows files and still be able to use it again when needed. I would personally be more interested in one-time cost. I already use "Bochs" and Windows 98 and Excel 2000 too on my "Note 3", but it is a virtual machine and then it is impossible to save files. Hmm Crossover for Android is indeed a quite neat idea. There are many Windows apps which I would love to run on a Android device, but the biggest problem with Crossover for Android is that it requires x86-64 hardware, and other than a few manufacturers like Asus and Lenovo there are hardly any x86-64 Android device manufacturers. Most of the top end Android devices which have the potential to run Windows apps with satisfactory speeds are powered by ARM processors. So I would like a ARM port of Crossover for Android. As far as I know there's a ARM port of WINE too, so if you guys use it as a core for Crossover for Android I'm damn sure that it would work great on ARM processors too. I would like to see CX on Android.. and will probably consider more Android devices because of it. I love CX on linux, and use it for all those pesky Windows only programs. I would like to do the same on an Android tablet. Yes, we've done CrossOver Android on ARM processors before. The main issue there is performance ... there are relatively few (well, er, vanishingly few, really) desktop ARM Windows binaries out there. That means that while Wine can give you the Win32 API on ARM, very little can make use of it at native speeds. But we're trying! I know I'm a little late to get bribed, but I don't care as long as you read my plea! I've been dreaming for years about being able to play SimCity 4 Deluxe on Android! And you are the only ones that can make it happen! I can't wait to hear you scream EUREKA! CrossOver Android is a decent idea applied to a dubious technology. Windoze provided so many restrictions, and acted as such a pain in the neck, that it was dropped years ago as a consequent. Moreover, the computational potential was recognized, and the arena was consequentially expanded, with the release of Android! Best luck as the result of your trial. I have to wonder, that anyone else that was bothered in the same way that I was, didn't migrate, or isn't migrating, to the Ux environment, though? Apparently that IS the motivation. Windoze blows, don't have to be bothered by it any more! CrossOver Android is the perfect product to Microsoft Project, Microsoft Visio AND Notepad++. I would prefer one time cost over subscription. I have a Wacom Cintiq tablet that runs android lolipop 4.2.1 and i am hoping to get to run Autodesk Sketchbook pro 7 which is a digital art software program. if android systems can support microsoft program apps like Photoshop, Flash, and Illustrator that would tap into the graphic design, animation, and digital art community then that would open the doors for artists who choose to use android systems on drawing tablets. I could sense it would be a demand in the trend.